As Invisible Children and Resolve continue the push to support the US advisers in their collaborative mission to apprehend Josephy Kony, there continues to be a lot of discussion about the perceived militarism of the campaign. One of the primary focuses of the Kony 2012 campaign is, of course, to capture Kony. If the multinational effort to apprehend Kony is successful, it will have lasting impacts on peace and security in the region as well as bolster the fragile framework of international justice. If it is unsuccessful, it has the potential to be damning for the people on the ground. The more peaceful the resolution to this conflict, the better. But it’s worth discussing why this is the option that many of us are talking about right now. 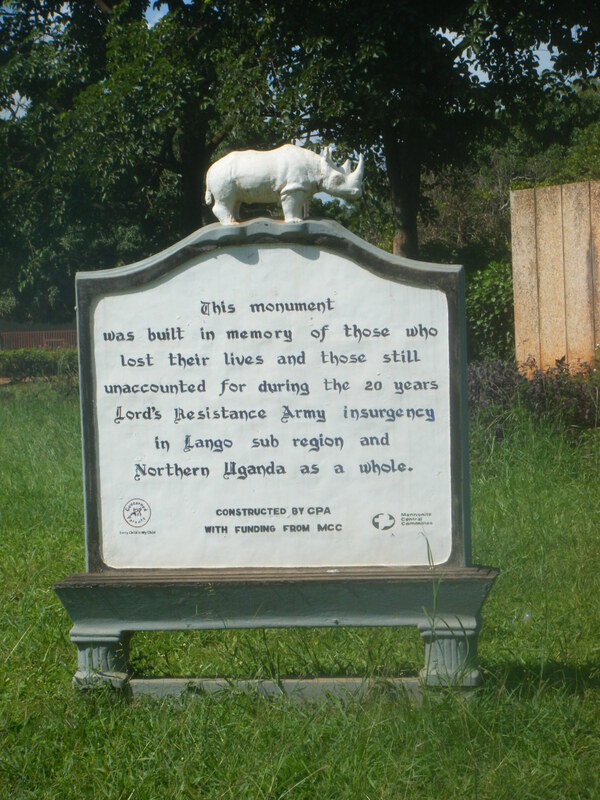 A monument to LRA victims in Lira town. The LRA grew out of the Alice Lakwena’s Holy Spirit Movement, but incorporated other northern rebel groups in the aftermath of current President Yoweri Museveni’s rise to power. In the ensuing years, the LRA became more and more of a problem for the government, which reacted in two ways. Betty Bigombe was appointed as a government minister to deal with the insurgency in 1988, and she encouraged defections and established a dialog with the LRA. Meanwhile, the Ugandan military (NRA) launched Operation North, which included arbitrary arrests of alleged collaborators and attacks against LRA positions. In 1992, Bigombe set about creating Arrow Groups, village militias to defend against the LRA, but the rebels reacted with brutal attacks against civilians to discourage collaboration with the government. In 1993, Bigombe decided to reach out to the LRA to begin the process of a peaceful resolution to the conflict. Talks began that November, with the LRA searching for blanket amnesty in return for disarming. During the peace talks, Gulu was incredibly peaceful and NRA leaders began taking part – but relations deteriorated as military leaders asked for surrender while LRA wanted integration. LRA placed the talks on hold and NRA leaders grew more impatient, and in February of 1994 President Museveni suddenly announced in Gulu that the LRA had seven days to surrender. Attacks resumed almost immediately, and the LRA began to perceive the Acholi civilians as collaborators, leading to the rise of civilian casualties. Soon the LRA began establishing bases in Sudan, where they rearmed and stepped up attacks in northern Uganda, including the Atiak massacre. This was also the beginning of widespread use of abductions both as a tactic and for recruitment. The IDP camp in Kitgum, credit K. Burns, USAID. In response to massacres like the one at Atiak and the high-profile abduction of the Aboke girls, the Ugandan government enacted a dubious plan to address the crisis in Northern Uganda – by corralling civilians into displacement camps. The camps were ostensibly to protect civilians but in reality had little protection and scarce food, water, and sanitation. The government of Sudan supported the LRA, in part as retribution for Uganda’s support of the Sudanese Peoples Liberation Army (SPLA), the rebel movement that would later help win independence for South Sudan. With this support, Kony and the LRA unleashed more violence against Ugandan civilians in the north while maintaining bases in southern Sudan, where they also attacked civilians on behalf of the government there. After the 1998 embassy bombings and even more after 9/11, the U.S. pressured Sudan for assistance in counter-terrorism efforts that also led to an agreement allowing the Ugandan military, now the Ugandan People’s Defense Force, to launch an attack across the border into southern Sudan. The Ugandan military had just withdrawn from the DRC, where soldiers had looted the country’s resources and killed numbers of civilians during the Second Congo War. Many of these returned soldiers were sent to Sudan to take part in Operation Iron Fist. The results were disastrous: the LRA fled the attacks and slipped back into Uganda, carrying out reprisal killings at IDP camps across the region. In the mid-2000s, the two sides were brought together for infrequent negotiations. The Ugandan parliament passed an amnesty law that allowed some LRA to return home and a ceasefire zone was established, but talks ended when chief negotiator for the LRA Sam Kolo surrendered to the government. It was also during this time that the ICC investigated the LRA for mass atrocity crimes, eventually issuing indictments for the LRA leadership. Meanwhile, most rebel fighters migrated westward to the Garamba National Forest in northeastern DRC, where they settled as a new set of peace talks began in Juba, Sudan. Cessation of Hostilities included a series of short-term ceasefires, allowing northern Uganda to begin its recovery while negotiations continued. Comprehensive Solutions, which included issues of the national government’s institutional mistreatment of northerners and the resettlement and rehabilitation of IDPs. Accountability and Reconciliation was one of the biggest issues that forced the talks to be put on hold several times. Eventually, they agreed on a hybrid system that included a truth-telling mechanism and reparations for victims along with the creation of a human rights branch in the High Court of Uganda and the removal of the LRA from Ugandan terrorist lists. The issue of the ICC was somewhat vague, but both sides seemed willing to accept an end to the conflict in exchange for withdrawing warrants. Permanent Ceasefire was signed in early 2008, assigning a battalion of SPLA soldiers as ceasefire monitors once the final peace agreement was signed. Disarmament, Demobilization, and Reintegration required the Ugandan government to address the ICC issue and allow LRA fighters to reintegrate into the national army. Those not willing to join the army agreed to disarm, and child soldiers would be supported through reintegration and educational programs. In 2007 there was progress on the issue of accountability and reconciliation, but this progress was tainted by rumors that Vincent Otti, Kony’s second-in-command, had been executed after a power struggle within the LRA. Despite this, the two sides reached agreement on accountability in terms of alternative forms of justice, but the question remained of whether the ICC would drop its warrants in exchange for a peaceful resolution to the conflict. Kony refused to sign the final agreement until the indictments were lifted, and Uganda refused to apply to try war criminals under complementarity until after the LRA disarmed. The talks collapsed in April of 2008, with several failed attempts to reconvene throughout the summer, along with reports of LRA attacks in rural South Sudan and the DRC. It was against this backdrop that the UPDF launched Operation Lightning Thunder, an attack coordinated with the DRC and South Sudan with intelligence and logistics support from the U.S., in December of 2008. The attack routed the rebels, who anticipated the attack, but failed to lead to the capture of any leaders and freed a minimal number of abductees. In response, the LRA set in motion what has been dubbed the Christmas massacres. In a coordinated attack across several towns and villages in the DRC, the LRA massacred hundreds of civilians and abducted around 100 more. Since then, the Ugandan force was kicked out of the Congo in early 2009 due to international disputes, and the ill-equipped Congolese military has continued the charge against the LRA there. The UPDF halved its LRA-hunting force in order to step up its presence in Somalia as a part of the peacekeeping force there, AMISOM, and the forces that remain on Kony’s tracks are ill-equipped for a manhunt. The LRA, according to the LRA Crisis Tracker, have shifted further west and north to ungoverned spaces in CAR and DRC. LRA attacks and sightings in 2012, to date. via LRA Crisis Tracker. More recently, the US sent military advisers to the region in October of last year, and the African Union has nominally stepped in to create a multinational, Ugandan-led force. The hunt for Kony seems to be active in CAR, DRC, and South Sudan with some US advisers based in Uganda while others work in the field (reportedly setting up a base in Obo, CAR). Civil society groups both locally and in the US have called on the forces to ensure the protection of civilians from retaliatory attacks and have put forth efforts to encourage LRA combatants to disarm and come home. As Paul Ronan points out, however, Uganda’s Amnesty Act is set to expire this year, which could have dire consequences for the effort to convince rebels to return. The multilateral deployment continues its hunt for Kony. As Patrick Wegner explains, the mission has had some success in reducing the amount of attacks carried out by the LRA in late 2011 (although this could be an LRA tactic since attacks dropped after a meeting between LRA commanders supposedly occured), but has accomplished little so far as capturing Kony and has failed to protect civilians in remote parts of the DRC. The history I just bulldozed through shows that a military plan is not foolproof. But it also shows why many remain skeptical of a peaceful solution. Historically, the Ugandan government has alternated between negotiations and military incursions, and the LRA have used peaceful time periods to rearm and regroup. When the Juba Peace Talks fell through, the LRA had rearmed and the Ugandan government had given up on waiting for Kony. We are currently seeing lower hostilities committed by the LRA, but they may be regrouping once again. Ever since the peace talks failed, groups like Resolve have looked at the option of a military apprehension of Kony that can effectively end the LRA. As Resolve recently stated, they are not opposed to a peaceful resolution. Indeed, if the LRA and relevant governments can reach a peaceful and legitimate agreement that addresses grievances of victims and leads to an end to the conflict, it would be a huge step towards pacifying the area and rehabilitating abductees, and it would avoid putting abducted soldiers and innocent civilians in danger. But if disingenuous, negotiations could lead to an impatient military attacking a rearmed rebel group again. This entry was posted in Conflict and tagged Amnesty, DR Congo, Kony 2012, Lord's Resistance Army, Sudan, Uganda. Bookmark the permalink.